The Maccabeats, who will be performing at CBSRZ, March 11, 2018. CHESTER — Congregation Beth Shalom Rodfe Zedek’s (CBSRZ) Music & More (M&M) 10th anniversary season 2018 is set to bring a diverse entertainment package to the shoreline community. For a decade the Music & More series has been known for first class entertainment offerings presenting artists with a broad spectrum of music from classical, folk and jazz to a cappella and has distinguished CBSRZ as a vibrant and significant cultural center. For this M&M 10th anniversary season, CBSRZ is changing it up just a little to present even more entertainment. Kicking off the M&M series something familiar, something peculiar Comedy Tonight!, on Saturday, January 27, 2018 at 8:00 pm. The CBSRZ stage will be transformed into a New York comedy club featuring Alexandra McHale and Johnny Lampert, both veterans of Comedy Central, network TV, casinos, and the NYC comedy club circuit. This show is for audiences of 18 years old and older. Adult beverages will be served. Doors will open at 7:00 pm for a pre-show reception. Back from last year’s extremely popular performance, The Maccabeats return on Sunday, March 11, 2018 at 4 p.m. to the M&M stage. 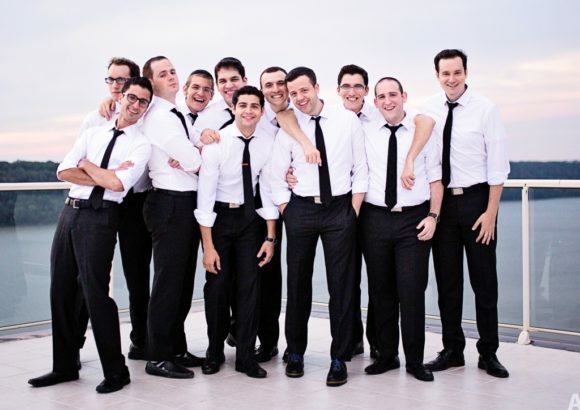 The Maccabeats are the premier a cappella group from Brooklyn who are a social media sensation with their inspirational and infectious brand of entertainment. Using nothing more than the unadulterated human voice, a clean-cut presentation, and a little Jewish humor, this unique group of singers is able to connect with fans of all ages. Doors will open at 3pm There will be a reception following the concert for a chance to meet and greet the band. Described as is an imaginative and dynamic new force on the national bluegrass scene, The Lonely Heartstring Band will bring their unique brand of music to the M&M stage on Sunday, April 15, 2018 at 4:00 pm. This multi-talented group of musicians are a classic Bluegrass quintet combining soulful instrumental virtuosity with soaring three-part harmonies. “This unique anniversary season offers a tremendous entertainment package that I believe has something for everyone,” comments David Zeleznik, producer of Music & More and member of CBSRZ. A season subscription through advance ticketing for the three show Music & More series can be purchased at a savings of a 14% discount by visiting www.cbsrz.org/events or through the Music & More at CBSRZ Facebook page https://www.facebook.com/music.more.cbsrz. For more information call the CBSRZ office at 860-326-8920 or through email at office@cbsrz.org. Performances are held at Congregation Beth Shalom Rodfe Zedek, 55 E. Kings Highway, Chester, Connecticut.